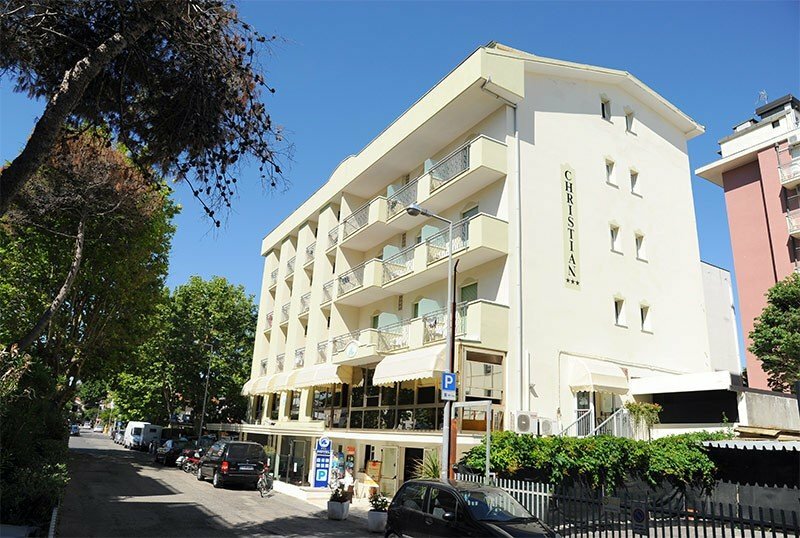 The 3-star Hotel Christian in Riccione is a comfortable family-run hotel that offers its guests on-demand parking, shuttle service, WI-FI connection and services for children. Accept small and medium-sized animals. The hotel is located in Riccione near the beach, in a quiet side of the promenade not far from the center of Riccione. The rooms all have a balcony and some have a sea view. They are available: WI-FI connection, air conditioning, safe, satellite TV, telephone and private bathroom with shower, courtesy set and daily cleaning service. On request: minibar, hairdryer, breakfast in the room. Open-air porch with sofas and tables, terrace, reading room, satellite TV room, lift, 24 hour reception, shuttle service to the station and airport on request, theme nights. PARKING: free, covered and uncovered (available on request). AIR CONDITIONING: free in both common areas and rooms. CONVENTIONS: beach, amusement parks, swimming pool, shuttle service on request, free entry to the Beach Village water park. SERVICES FOR PEOPLE WITH DISABILITIES: ground floor entrance with sloping ramp, large rooms with wheelchair maneuvering space. BREAKFAST: buffet with a wide selection of homemade sweet and savory products. LUNCH AND DINNER: three-choice menu with typical and international dishes always accompanied by buffet of appetizers, vegetables and salads. Drinks (water, wine and soft drinks) are included with meals. VARIATIONS: celiac cooking on request. OTHER: every week Romagna-themed dinner and aperitif on the beach or on the terrace. In the hotel: outdoor playground area, strollers, bottle warmers for common use, mini club and live entertainment. At the restaurant: baby food and high chairs. TOURIST TAX: excluded. € 1.80 per day per person aged 14 and up for a maximum of 7 days.